Canadians Apparently So Desperate For Cheap Cheese They’re Smuggling It In From U.S. There are crazy things happening in the world of delicious food lately. We’re all trembling in the shadow of an impending pork shortage, while thieves are targeting maple syrup reserves. The most recent case of coveted food hails from Canada, where pizzerias are reporting that smugglers have been offering them contraband cheese. Stealing cheese!? Have you no hearts at all? The Canadian Broadcasting Company (via NPR News) digs into this so-called “mozzarella mafia” operation, reporting that police in the Niagara area have been going around to restaurants and asking where they procured their cheese as part of a larger national investigation. Some officers are allegedly involved smuggling the cheese out of the United States, as well. Charges are said to be forthcoming against police who helped sneak the caseloads of cheese over the border. 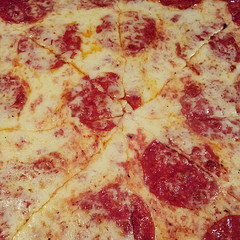 The cheese involved in the controversy is known as “brick” cheese and is often used on pizzas. U.S. cheese is as much as a third cheaper than the Canadian price, earning drivers $1,000 to $2,000 per trip. Canada Border Services Agency officials say anyone caught redhanded with these delicious bricks would be in violation of the Customs Act for failing to declare and pay taxes on the stuff. You’d also be in trouble for not having permits from the Canadian Food Inspection Agency and the Department of Foreign Affairs and International Trade. One pizzeria owner says he faced a smuggler two years ago, who offered to sell him cases of contraband cheese. He tried a bite but ultimately turned it down because it was illegal and really? Not that tasty. Do the right thing, pay full price for your cheese.